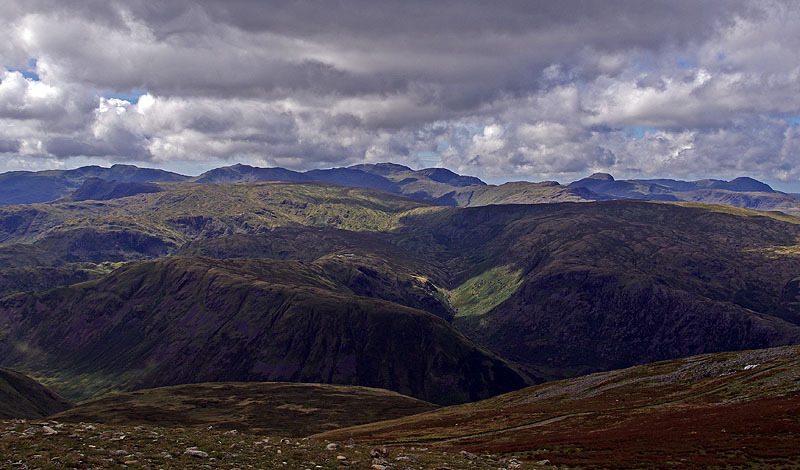 For many, the Eastern Fells mean Helvellyn and Striding and Swirral edges, and why not? 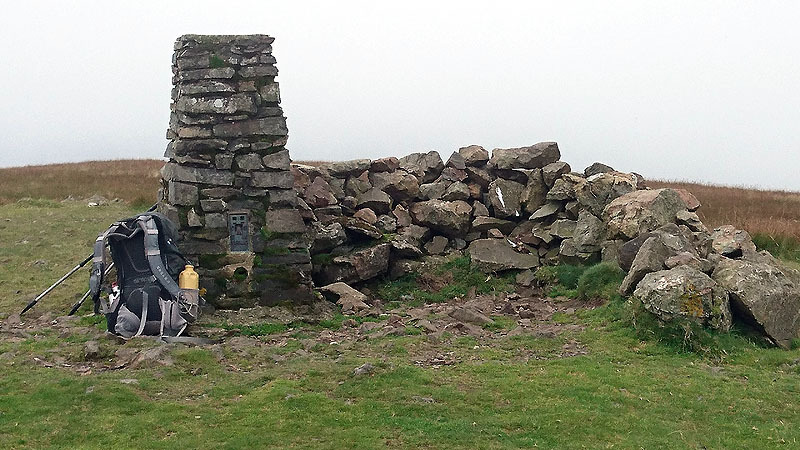 Surely this is one of the classics of English hill walking. But Helvellyn is merely the centrepiece of a long north-south ridge that is well worth exploring, and by no means the only fine hill of the group. In my August 2016 trip I chose an enterprising route up to one of Helvellyn’s main satellites, Dollywaggon Pike, and a completely contrasting line over the rounded hills to Helvellyn’s north, centred on Great Dodd. Helvellyn via the two edges featured in one of my earliest hill-walks (1974), and the Fairfield Horseshoe in 2007 remains my wife Barbara’s longest-ever mountain excursion. Thursday 25 August 2016. 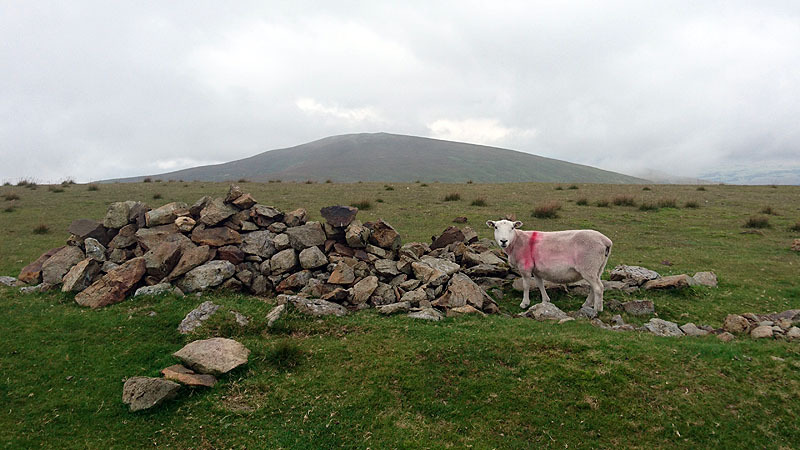 Great Dodd and its satellites, ten miles. These rolling grassy hills to the north of Helvellyn are in many ways atypical of Lakeland, apart perhaps from the northern fells behind Blencathra, but that is all to the well and good: you have a chance of solitude. Indeed, despite an approaching bank holiday, I saw barely a dozen people all day. 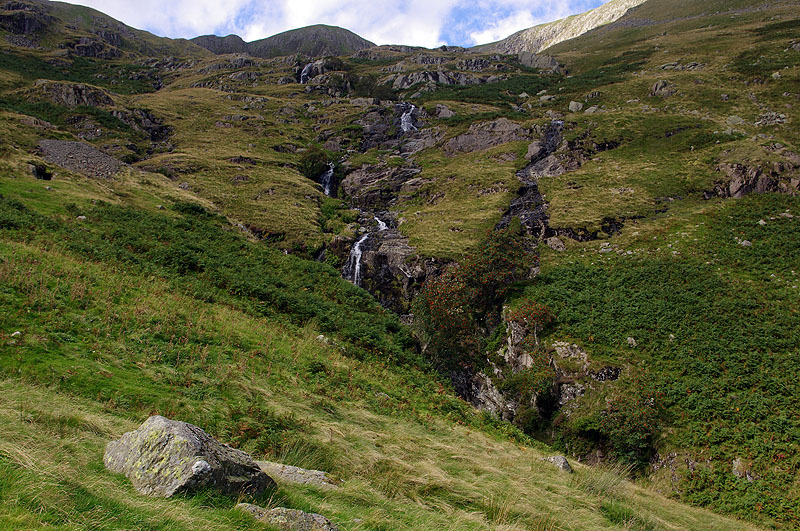 This made sense as a linear walk, starting at Dockray, which I reached by the morning bus from Glenridding. It’s a long and lonely plod from here along the old coach road. I left the old coach road at Mosedale Beck for the straightforward, and totally untracked, climb up to the first hill of the day, Clough Head (2382ft). It’s an unremarkable summit, one of Lakeland’s loneliest outliers, but at least I had something of a view, the cloud just brushing the top. 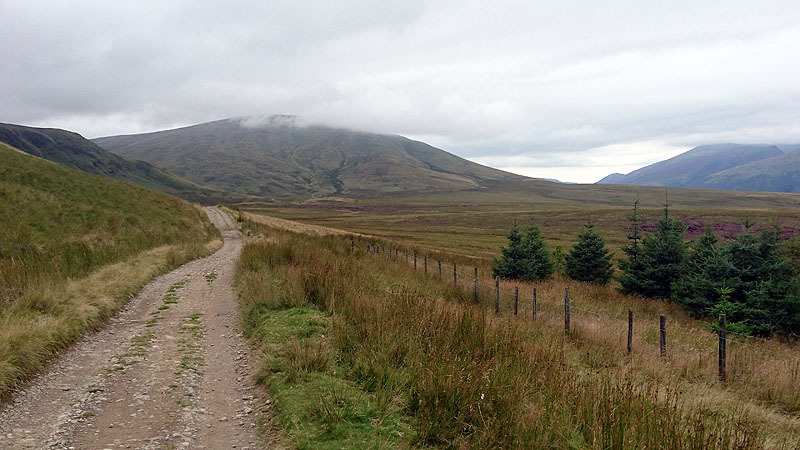 The cloud enveloped me soon enough, on the way to the highest hill of the day, Great Dodd (2812ft), and across to Stybarrow Dodd (2766ft) as well. Things started to improve over Green Side (2608ft), one of the few Hewitts that is not also a Wainwright, and were markedly better at the day’s last hill, Sheffield Pike (2215ft). Though the lowest hill of the day, Sheffield Pike was in many ways the most interesting, jutting out craggily above Ullswater. The safe way off is to backtrack to the hause to the west and drop down the zig-zags to Glenridding Beck, but a path headed off encouragingly to the SSE, so I thought I would try that. A couple on the top with me were debating whether to go that way, but as I managed to stumble awkwardly at the cairn, I don’t think they wanted to follow! Yet the path works, following down the ridge of Heron Pike to a bracken-fringed path circling Glenridding Dodd. 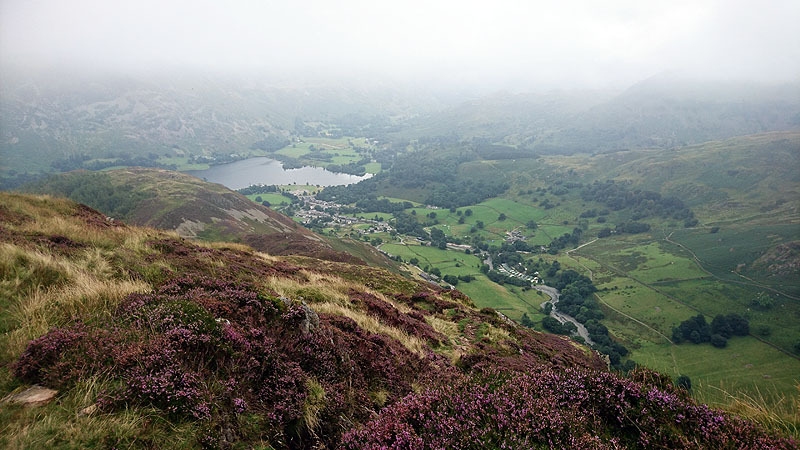 All that remained now was to decide which pub to eat at, and as the Traveller’s Rest at the top of Glenridding village soon appeared, this was not a difficult choice. And later, the zig-zag couple stopped too. Friday 26 August 2016. Dollywaggon Pike via The Tongue, ten miles. The next day was much brighter, with cloud well above the tops. There’s a cluster of hills between Helvellyn and Fairfield which don’t always get their due, Dollywaggon Pike and St Sunday Crag amongst them, and it was a good day to explore them. 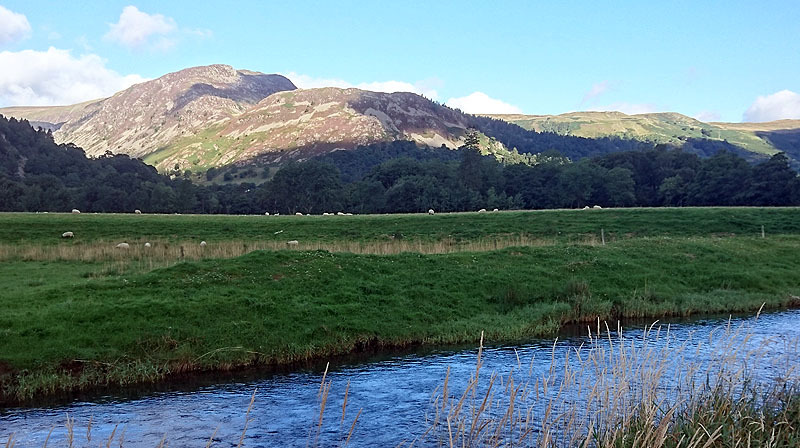 This route set itself nicely for a circular walk from Patterdale village, though to get there I had first to cross Goldrill Beck, the day’s main objective in sun-dappled view. 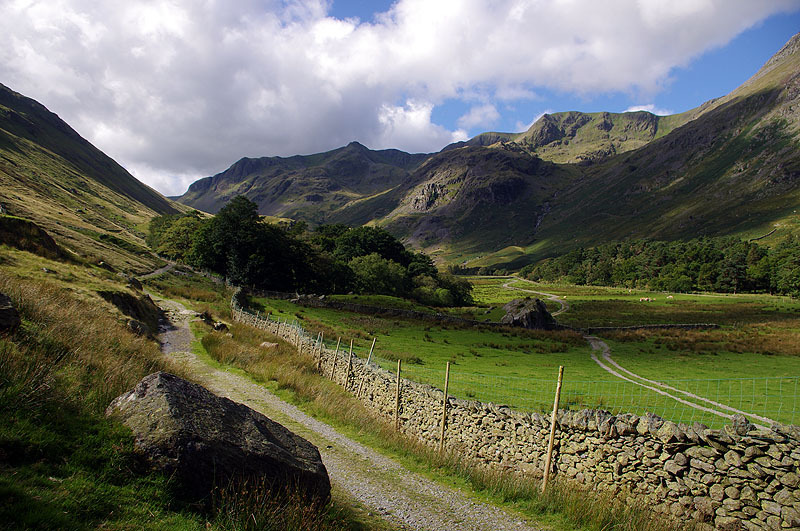 After munching on a breakfast sarnie at the post office, there was a long walk in down Grisedale, a typical Lakeland dale and so a joy to be following. 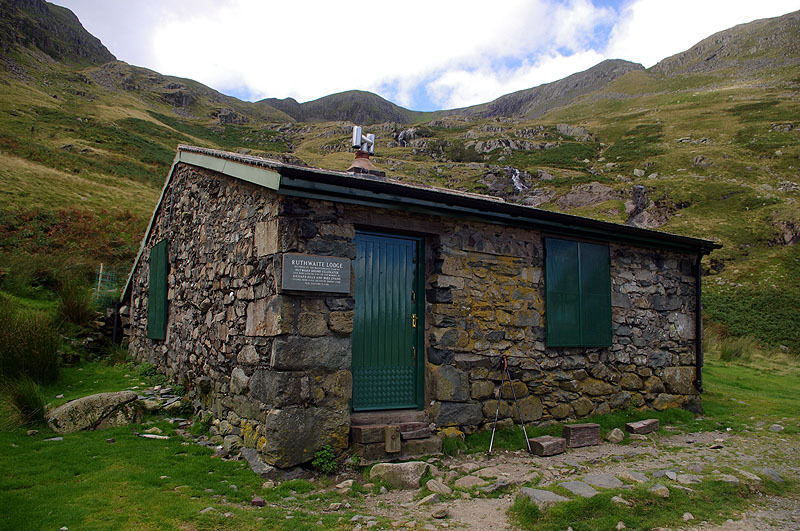 At the climber’s hut of Ruthwaite Lodge, where the Coast-to-Coast path heads down from Grisedale Tarn, there’s interesting route that heads up to Dollywaggon Pike (2810ft) via The Tongue. It’s not quite a scramble, but it is steep, and there’s the chance to get up close and personal with a bit of rock. I was never quite in doubt of my route finding, but there was one little gully which seemed a little more committed than most of the route: just when I was begining to be a little uncertain, there was a little cairn right in the middle! The route soon crosses to the NE prow of the Pike, a grand way to reach the summit. Looking westish to Scafell Pike and its companions, the weather seemed to be closing in – indeed walkers over there were probably having some unscheduled rain. 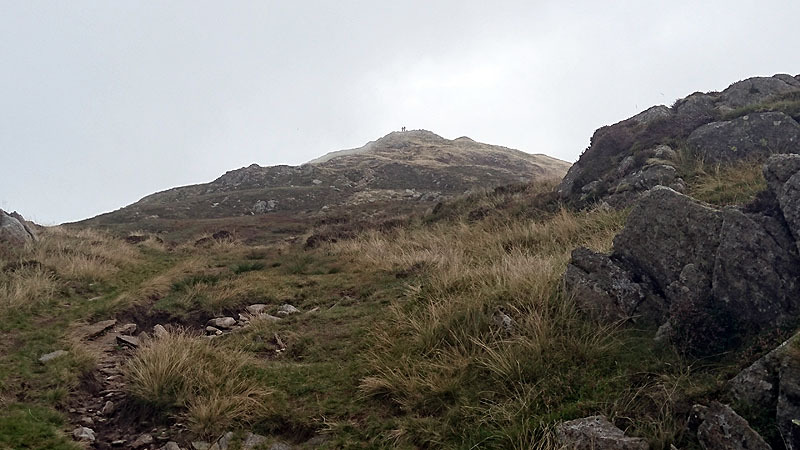 Before St Sunday Crag I had one other hill planned, Seat Sandal (2415ft). Unfortunately it’s not remotely as good as the other two, but it’s in the area so might as well be taken. 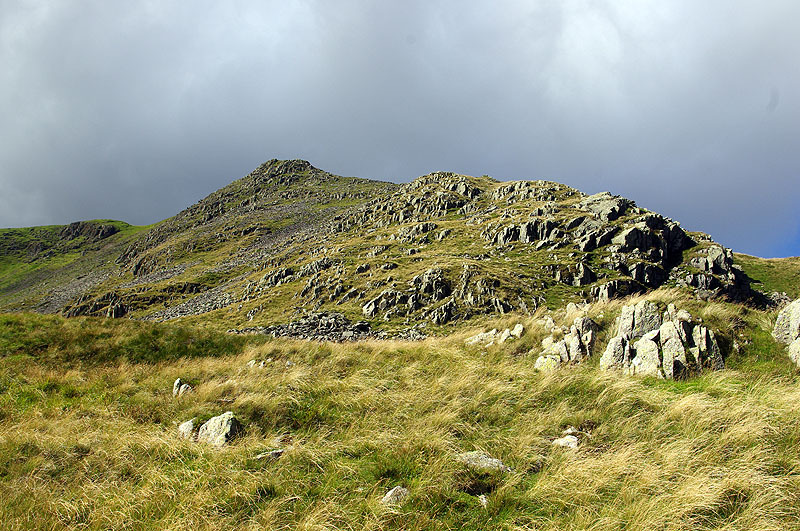 I dropped steeply and directly off Dollywaggon to a saddle just above Grisedale Tarn, and then went straight up the other side, which might have been called Seat Sandal’s north ridge if it did proper ridges. The box duly ticked, I headed down to Grisedale Hause, then contoured above the tarn for a while before heading up to Deepdale Hause – it was relief to be on good tracks again. 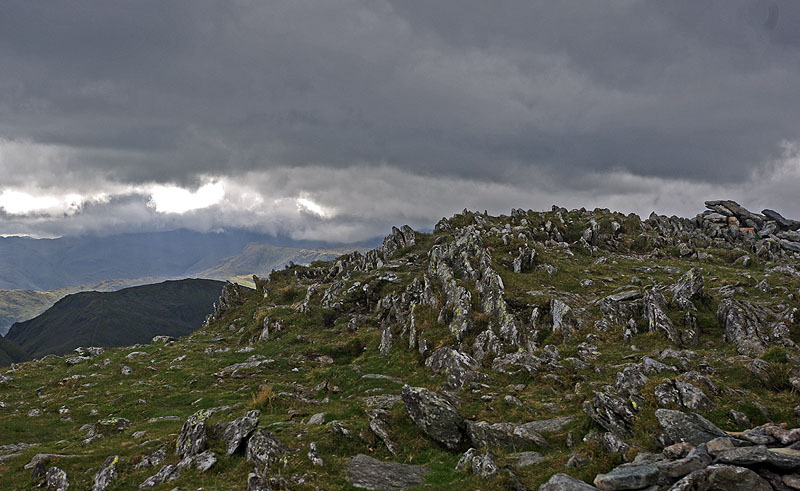 The ground then rises inexorably up what is undoubtedly a ridge, the SW ridge of St Sunday Crag (2756ft). From here the path heads relentlessly down the hill’s NE flank back towards Grisedale bridge, but rather than drop directly to the beck, I took a little path which twisted through Glenamara Park before arriving at the back door of the Patterdale Hotel.